Intercoms which allow a user to speak to, and hear a caller at their door. 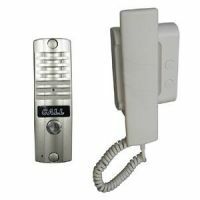 These intercoms can also release a door latch so a caller can be let in without the user having to go to their door. These products let you open your front door from another room in your house. Some buttons are portable so you can keep them with you whereever you are in your home, others can be fixed to a wall, e.g next to your ususal armchair.